Urban environments are dominated by pavement, the bane of most living things. One area ripe for community greening is the hellstrip—the narrow space between the sidewalk and street curb. Sometimes planted in grass, filled with weeds, mulch or simply bare trampled earth, this public space could be planted with tough native plants. Let us reclaim this forgotten territory and create some native habitat that will cool ground temperatures, absorb and filter rainwater, support pollinators, and bring a smile to the passersby! It is important to remember that the hellstrip is first and foremost public space, even if you own the property. 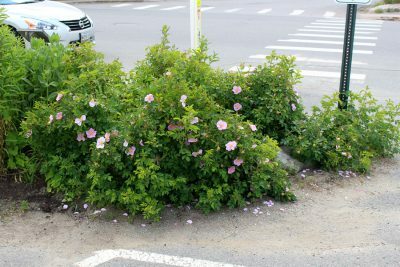 Pedestrian foot traffic, trash, dog waste, piles of snow, road salt, automobile exhaust, compacted soil, and parked bicycles are some of the daily risks that can impact plants growing in this environment. There are, however, native species that can tolerate much of this abuse. Depending on your situation, there are plants that thrive in sunny, dry infertile soils, wetland species that work in low spots flooded during a rainstorm, and woodland plants that thrive in shady spots that never see the sun. 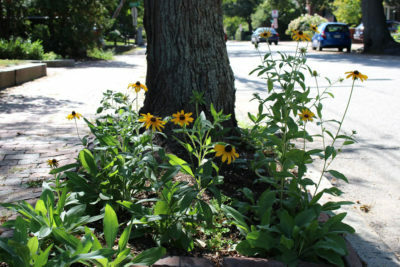 Many cities and towns across the country have changed their boulevard ordinances to encourage citizens to participate in the planting and care of these areas. Before you begin planting, you may need to contact your local neighborhood association, city or town to see what restrictions there may be for planting. 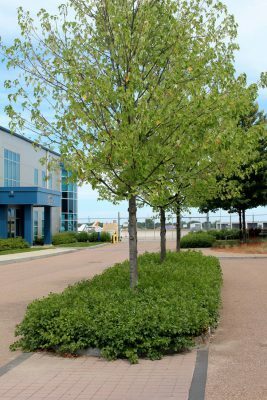 In general, the ground layer plants should be under two feet tall, and street tree heights should take into account overhead wires. If there is any chance of underground wiring or other utilities, contact Dig Safe. Determine the light levels and soil conditions of your site. You will have to start digging to determine the soil characteristics—note if the soil is well drained (sandy or gravelly soil) or compacted or clay. Soil compaction is the biggest problem in urban areas and it can be remedied with a simple digging fork. Once planted, you can create a site that will overcome this urban ailment, as plant roots are key to maintaining healthy soil structure. Wild rose on the edge of a parking lot and main street. You may choose to plant species that are all herbaceous and/or include low shrubs, and perhaps even a street tree. If your hellstrip is next to on-street parking, you should plan for a way for people to cut across. 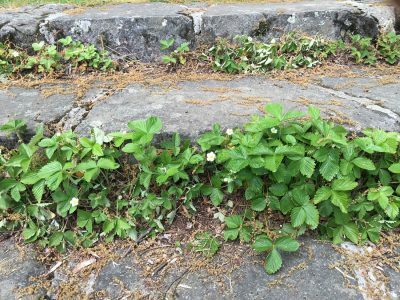 Stepping stones or a narrow brick or gravel path will give people a way to get to the sidewalk without stepping on the plants. You could even include a bench to welcome passersby to stop and enjoy the space (make sure it is firmly bolted to the ground). Some planting beds might benefit with edging such as bricks or lumber. A digging fork is the most effective tool for repairing compacted soil. Soil is easiest to dig if it is moist, so water dry soil thoroughly the day before you plan to dig. Use your weight rather than your back to loosen the soil by stepping or jumping on the horizontal edges of the fork to pierce through the compacted earth. You are not trying to turn over the soil, just loosen and create airspaces between the soil grains. Dig down at least a foot to loosen the soil. Once planted, the roots will help maintain a porous soil structure. If you are planting under or around trees, you must be very careful with your digging and just pierce the soil with the fork, being careful not to destroy tree roots. 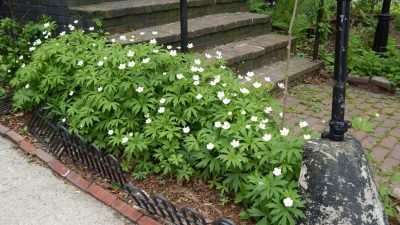 Depending on the planting types, you may add in old leaves or composted hardwood bark mulch for plants that like woodland soils or organic matter in the soil. Below are planting combinations for various hellstrip conditions. Do not be tempted to add nutrient rich compost to the soil. 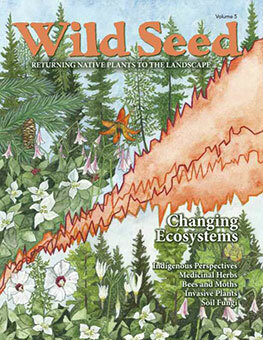 Most native plants do not have the high nutrient demands of our vegetables or highly bred ornamental plants. 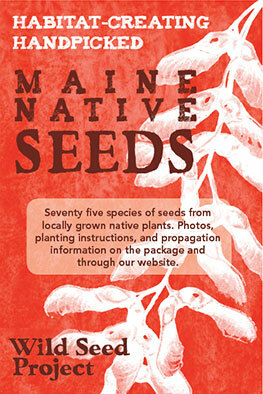 Species with an asterisk (*) are easy to grow from seed and are available for purchase on our website. The fastest and cheapest solution for a sunny dry site is to sprinkle black-eyed coneflowers seeds (Rudbeckia hirta)* after you have prepared the soil. This is the rare native perennial that will bloom heavily the first year from seed. Have you planted a hellstrip garden in front of your house? 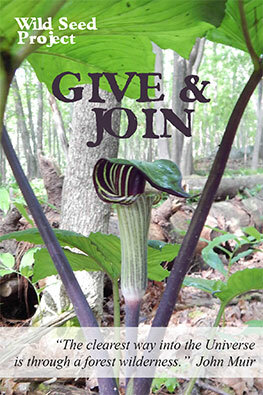 Send us your photos via info@wildseeproject.net or post them on our Facebook page!